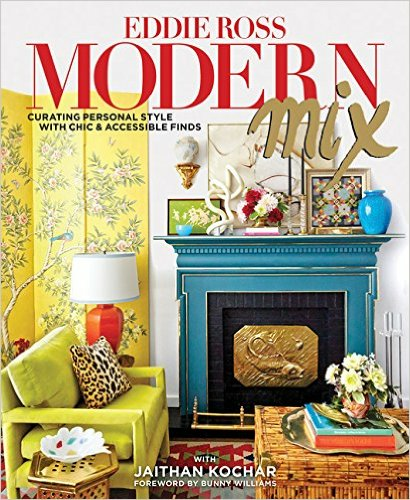 My friend Sonya (who is fun to follow on Instagram @sonyaflanagan_wine.dine.design) recently reminded me to check out Eddie Ross’ book Modern Mix: Curating Personal Style with Chic & Accessible Finds - & I’m so glad I did! Eddie’s infectious way of describing the thrill of the hunt and how to take care of your tag sale treasures is really inspirational. Eddie takes you through a million ways of seeing potential in humble, thrift store items & then giving them new life in your own home. As I looked around my living room while reading Modern Mix, I realized just how powerful this kind of collecting can be. 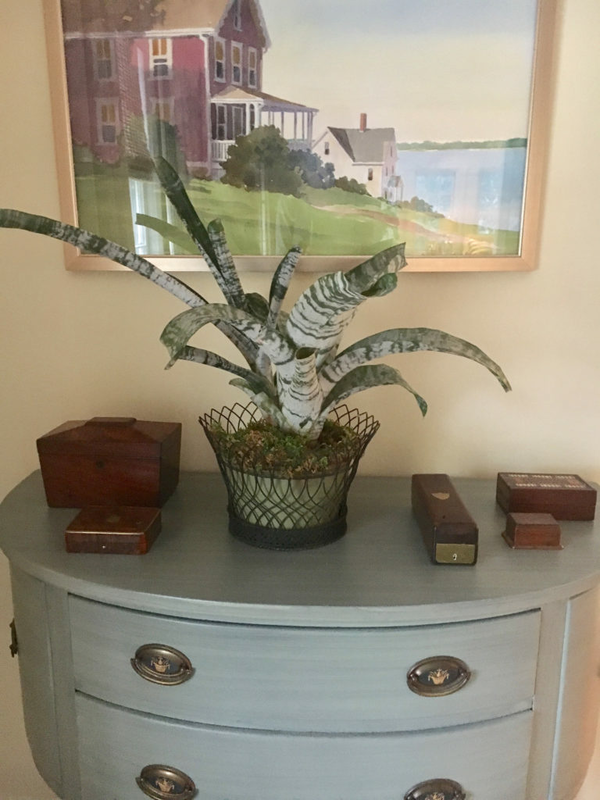 One of my demi-lune tables, which a local decorative painter redid for me a few years ago, is topped with a beautiful collection of antique English boxes that my late mother collected. Above it hangs a watercolor scene of Noank, Connecticut that my father painted. Oh, and the planter was my grandmother’s! None of these items are expensive or rarefied, but together they give me (& my girls) a sense of beauty and memories that we can cherish long after the flea market grounds have closed. My very first antique store purchase was a joint one with my brother and sister for our mom’s birthday, as she loved Russian boxes. I was 11 years old, Carole 9, and Scott 7. Somehow we got a moment alone with the owner of the shop & explained our interest in the box — I was nervous but prepared to negotiate the price a bit. Imagine how relieved I was when the owner instantly offered us a slightly lower price because of our age and the unique situation of 3 small children coming in with a plastic Yankees baseball hat full of singles and coins! Travel finds are of course another huge inspiration and enrich your house with so much energy. I love mixing pieces picked up from faraway (the black ebony candlesticks are from a souk in Marrakesh) with favorites from my own neighborhood (the candle lanterns are from The Kellogg Collection in Washington DC). Last but not least, my husband & I have a joint collection - which frankly is kind of getting too big. Every summer and sometimes winter too, we visit Simon Pearce in Queechee NH and find 1-2 pieces of glassware from the “Seconds” lots. These incredible vessels may have a slightly heavier weight, or possibly the watermark stamp at the bottom is mottled — we don’t care, in fact, I think it makes the whole ensemble more original! But because we are willing to put up with these “imperfections,” we are treated often to a 50% discount on each piece. Hence, after 20 years the collection has gotten quite large…. In posting these for you today, I realized just how UN-inspiring my glasses look in the plain white cabinets. 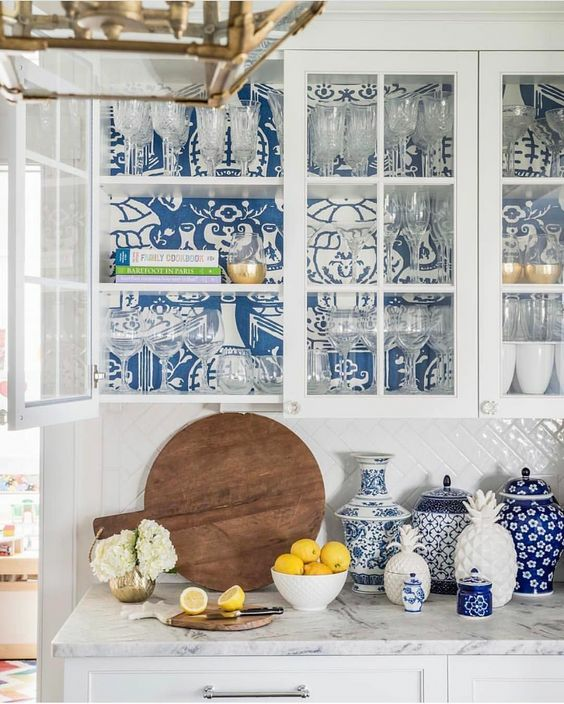 Seems like some wallpaper needs to make a visit here soon, like this pretty tableau via Instagram by Dina @honeyandfitz! A couple of years ago, I managed to wallpaper my china cabinet myself using a grass cloth wallpaper remnant….and tucked in the golden cherubs of my mom’s for good luck. After all, she helped me pick out the Richard Ginori china 20 years ago & it has served us very well for many holidays and family dinners since. Where would we be without all these little visual treats and things to make us smile?? To me that is the magic of personal collections and I LOVE how Eddie Ross’ book brings all these elements together in one gorgeous tome. What do your collections look like? Any tips to share? I’d love to see how you do it in your home — email me at Lee@ElegantMayhem.com. Thanks & enjoy! !